Free RV camping is an excellent and affordable way to travel across the United States in your recreational vehicle. Finding free camping is fairly easy if you know where to look and are willing to sacrifice RV hookups. The four types of free RV camping locations are store parking lots, friends and families yard, boondocking and free organized campgrounds. All of these options may require dry camping where you have little to no hookups. Some stores, restaurants, and truck stops allow you to park overnight in your RV in their parking lot. Usually there is a one-night limit. Store owners benefit from allowing you to park overnight because they know you will probably shop in their store for items needed for your trip. It is very important to ask the store manager if you can camp overnight or you might get a citation from a police officer. Before you park, drive around the parking lot looking for signs that indicate the rules on parking overnight. Following is a short list of some businesses that have allowed overnight RV camping in the past and may still do so. Depending on your friends and family, camping may be available in front of their house, on their driveway or in the back yard. Many cities and neighborhoods have ordinances that dictate how long an RV can be parked on the street or driveway. 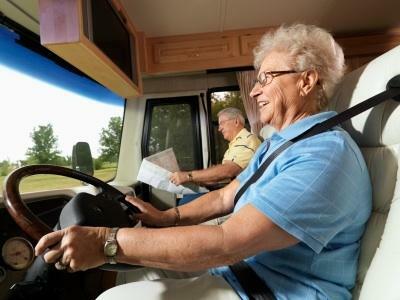 Call the police department and find out what regulations they have before you set up your RV. It is best to park in the backyard if available. Boondocking is a term that campers use to describe free camping on public lands. The United States Forest Service states that boondocking is allowed on public lands within 300 feet of public roads. The purpose of this rule is to prevent driving too far into the forest and damaging the plants and wildlife. It is best to locate previously used campsites or spots that are easily accessible from the public roadway. The United States National Park Service (which is different than the United States Forest Service) does not allow boondock overnight camping or parking in the designated national parks; you must stay in an authorized campground. Get maps and addresses by visiting the United States Bureau of Land Management and the United States Forest Services websites. One of the best ways to find free RV camping, especially boondock campsites is by becoming active in an online community forum. On these forums, people post their personal experiences in camping for free all over the world. Following are a few good forums where you can ask for or read about free camping spots.